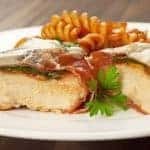 Dress up boneless chicken breasts by topping them with layers fresh spinach and basil, thinly-sliced tomatoes, prosciutto and a slice of melted Asiago (or provolone) cheese. 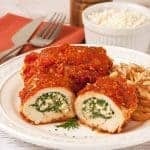 Serve with a side of pasta with marinara sauce and a tossed green salad for an easy, satisfying dinner. 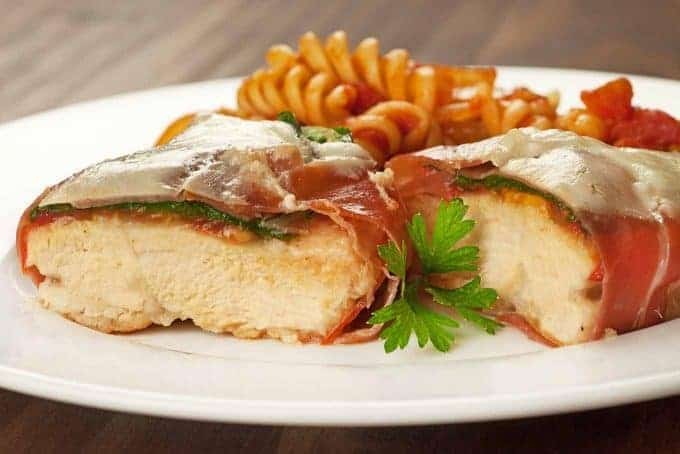 Boneless chicken breasts layered with fresh spinach, basil, and thin-sliced tomato, wrapped in prosciutto and topped with melted Asiago. Combine the flour, salt, garlic powder and a few grinds of black pepper in a shallow dish. Lightly dredge the chicken in the mixture, shake off the excess and set aside. Heat the olive oil in a large pan over medium heat. Add the chicken in a single layer and cook until light golden brown and just cooked through, 2 to 3 minutes per side (don’t overcook). Remove from the heat. Separate the slices of prosciutto and lay them out on a flat surface. Center a piece of chicken crosswise over each slice. 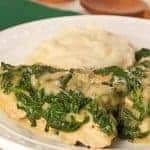 Arrange several slices of tomato on each chicken breast, then add 2 basil leaves and a portion of spinach. Wrap the ends of the prosciutto up around the chicken and toppings and press gently to seal. Carefully transfer the chicken to a shallow baking dish coated with nonstick spray. Top each piece of chicken with a thin slice of cheese. Bake for 7 to 8 minutes, or until the cheese is nicely melted. Serve with a side of pasta and a green salad. 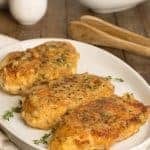 For best results, choose relatively small chicken breasts and be sure that you don’t overcook them initially because the extra time in the oven could make them a little dry. 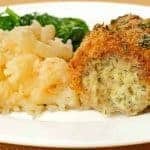 Asiago is our favorite choice for this dish because its tangy flavor complements the saltiness of the prosciutto very nicely, but don’t hesitate to substitute with mozzarella, provolone or fontina. Made this for dinner tonight and it was delicious! My husband said it was a “gourmet meal”. Easy to make and full of flavor!! Highly recommend! So glad you enjoyed the recipe. Thanks for taking the time to let us know.